Learn how to compare rates and save money. The Loan Estimate (LE) is your best resource in obtaining a competitive rate. By becoming familiar with the different sections of the LE, you’ll be able to determine which lender is offering you the best deal, and which one is priced too high. When shopping around for a mortgage, ask your lenders to provide you with a copy of the Loan Estimate (LE). This is as good as a signed contract from your lender to you. Lenders are legally bound by the loan estimate they provide you. This empowers you to compare your different LEs to determine which lending institution is truly offering you the best deal. Once you’ve gathered a few loan estimates, you want to focus on few sections: Loan terms on page 1, section A, B and Lender Credit on page 2. Step 1: Verify you're comparing quotes for the same loan product. Check Loan Terms on page 1. Before you begin, make sure that all of the loan estimates you are comparing show the same loan term, loan amount and interest rate. A 15 year loan at 3.5% will always be much less expensive than a 30 year loan at 3.5%. By verifying the loan terms from your estimates are all the same, you’ll be able to properly compare the different lender fees from your mortgage providers. 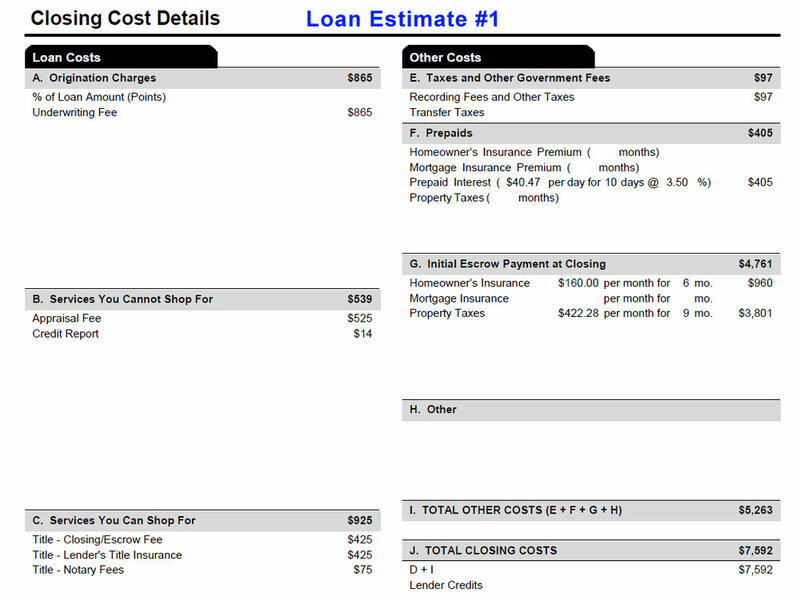 Step 2: Check the Loan Costs found in section A., B., and the Lender Credits found on page 2. The Fees located in Section A, B and the Lender Credits are the only fees your mortgage provider can control. The gray bar shows the total amount of fees for that section, and are itemized just below. When you are comparing different quotes, these are the sections you want to focus on to determine which lender is offering you the best rate pricing. Important Note: There are a lot more sections on the LE that you should definitely look at. However, when we are focusing on how to compare pricing from different lenders, banks and mortgage brokers. Your mortgage provider can only control sections A, B, and the lender credit. Although section C, E, F, G and H are outlined in your LE, your lender doesn’t really have any control over them. It’s important to point out that a sneaky mortgage provider might try to under bid sections C through H just to appear as if they’re offering competitive pricing, while actually quoting above average pricing in section A and B. Do not be fooled. When comparing bids from different lenders, look ONLY at sections A, B and the Lender Credits. These are the only sections your lender can control and is legally bound to comply with. Keep in mind, that although your lender cannot increase their fees once having given you a copy of the LE, there are still a few other variables that could affect your final loan pricing (changes in: loan to value, credit score, the bond market). If you’re concerned about interest rates and rate pricing going up, your best bet would be to lock in your rate as soon as possible once you’ve found a rate you like from a lender you want to work with. By locking in your rate, you help ensure you can obtain the rate and rate pricing you want. Have questions about your Loan Estimate? Feel free to contact us regarding any Loan Estimate you’ve receive from us, or any lender you’re working with. We’re happy to answer any questions you have may have. No obligation required. So which loan estimate has the higher fees? In LE 1, the fees in section A and B total to $1404. In LE 2, the fees in section A and B total $1549. It would seem that LE 1 has the lower fees, however, if you look at the “Lender Credit” section, LE 1 doesn’t offer any lender credit, while LE 2 is offering -$1583 in lender credit. So the net lender fees are actually $1404 for LE 1, and -$34 for LE 2. The signing of Dodd-Frank into law has created a huge benefit to the general public when it comes to shopping for a mortgage. It has enabled the TRID lending guidelines that are now in effect. As a result, every time you apply for a home loan on a 1 to 4 unit residential property, your lender is required to provide you with a copy of their loan estimate (LE) within 3 days of your application, and again within 3 days of locking your interest rate. The loan estimate outlines all of the fees involved in your loan, i.e. origination fee, underwriting fee, appraisal, escrow / title fees, etc. Although mortgage pricing changes daily, (sometimes two or three times per day depending on market volatility), what cannot change according to TRID lending regulations is the amount of money a lending institution charges a borrower as part of the origination and lender fees. Before Dodd-Frank, Loan Officers would bait-and-switch to their heart’s content, promising a home buyer a low rate / rate price at the beginning of the transaction, then just before closing escrow, hike up the fees as much as possible. On a purchase transaction this was especially detrimental given that a buyer often accepted the higher rate price rather than risk losing the home they were trying to purchase for the last 30 days. All this has changed. Dodd-Frank, as enacted through TRID, has completely done away with the mortgage industry’s practice of bait-and-switch. Lending institutions (banks, mortgage brokers, credit unions) are all prohibited from increasing their fees once they have provided you with an LE.